Meredith likes Skittles. Periodically, we ask in guild chat what everyone is eating as we head into a raid or an event or just to make conversation, like last night when I took a long flight so I could finish eating a piece of chocolate cake. Meredith eats Skittles. She had a conversation on Facebook about needing a proper bowl in which to hold the Skittles. Just having them in the bag wasn't really acceptable. The bag can rip and spill your snack all over the floor, not that I've ever had that happen to me. She found something that looked, from her photo, to be brushed aluminum or steel. It was a sleek design but, at least as far as I was concerned, didn't have much life to it. If you're going to sit at the computer and eat Skittles, the least you can do is eat them out of a unique container. And with that phrase, an idea was born. I would set out to find Meredith a unique bowl in which to hold her Skittles. Thankfully, this is the start of fair season. Every weekend, one can find some sort of arts and crafts fair in the Chicagoland area. The first weekend of the month was Wheaton's Cream of Wheaton festival which featured arts and crafts. I figured I'd start there and see what I could find. The first tent I walked into was a potter. She had exactly what I wanted at the price I wanted to pay for something unique. 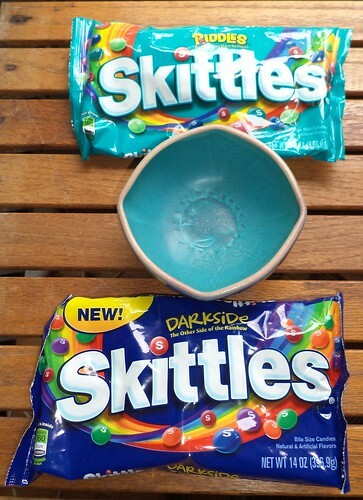 Now, I didn't set out to match the Skittles bag to the inside of the bowl. That was a happy accident. I didn't want anything too big. It had to hold at least a half a bag and if it held the whole bag, that was a huge plus. I saw several bowls that were cheaper than this but they were also much lighter in weight. As I turned them over in my hands, I realized that they had the potential to be knocked off the desk top. So, I spend $5 to get a hand made bowl, but it lasts all of two weeks because it's so lightweight, the cord from the mouse knocks it onto the floor. Well, there is no value in that. This bowl, as you see, has a "foot". That extra edge and its thickness, combined to give this weight. Even if Meredith's mouse cord gets caught on the "other" side of the bowl, it's not going to cause it to go flying. 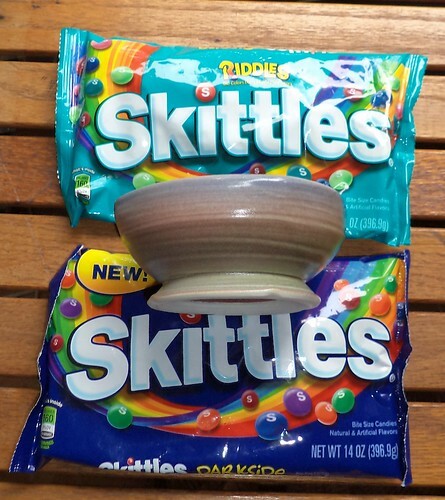 I had to send it with a couple bags of Skittles and, it appeared to me, that the bowl would hold almost a whole bag. I made the creator's day too by being her first sale. I can't find the business card I took so I can link to her site. She had some unique pieces, including handmade buttons. If I ever get around to making that new fall coat I keep thinking I want, I'll seriously consider getting handmade buttons for it. This was a hit with Meredith. She's sent so many wonderful boxes of awesome to me that something like this is the least I could do to repay her kindness. While her other bowl was okay, it really wasn't acceptable for someone as unique as her. Now, she has a one-of-a kind treasure for her Skittles.